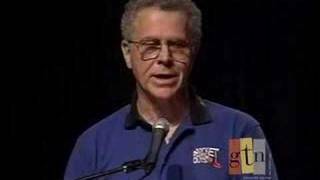 Homer Hickam March 2007 and The Three P's and it was No little rocket story. Very rare footage of Homer "Sonny" Hickam (Rocket Boys and October Sky) and zincoshine-propelled Auk rocket. Probably in 1960 at Cape Coalwood, the Big Creek Missile Agency's rocket range. Hickam is wearing the military-style cap. O'Dell (blonde hair) can be seen with him as they're handling the debris afterwards. The girl is neither Dorothy Plunk nor Valentine. Note the shock wave of the rocket knocks the camera from the hands of the cameraman (unidentified). A young man in a small West Virginia coal town dreams of building rockets to outer space as he witnesses Sputnik flying overhead. A perfect Hollywood opening scene, the story behind the hit film October Sky is all the more remarkable because it is drawn from the real life of former engineer Homer Hickam. Hickam is interviewed by Ohio University chemical engineering professor Dr. Nicholas Dinos.